Officine Panerai used the SIHH event as the backdrop for a very big announcement for the upcoming year. 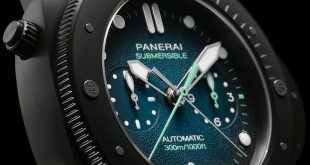 In continuation of their connection with the sea, Panerai has teamed up with the America’s cup as the official time piece maker of the historic sailing competition. The 35th America’s cup, which will be held in Bermuda this year, is a race that dates back to England in 1851 when they sailed the southern coast. 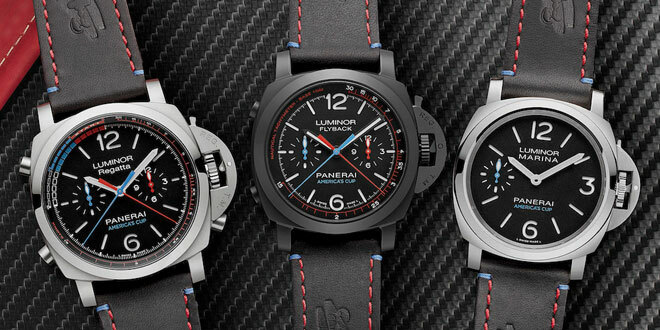 It was only fitting that a brand such as Panerai, whose roots tie back to the Italian Royal Navy, would become a sponsor and introduce 5 new special editions in their America’s Cup line. 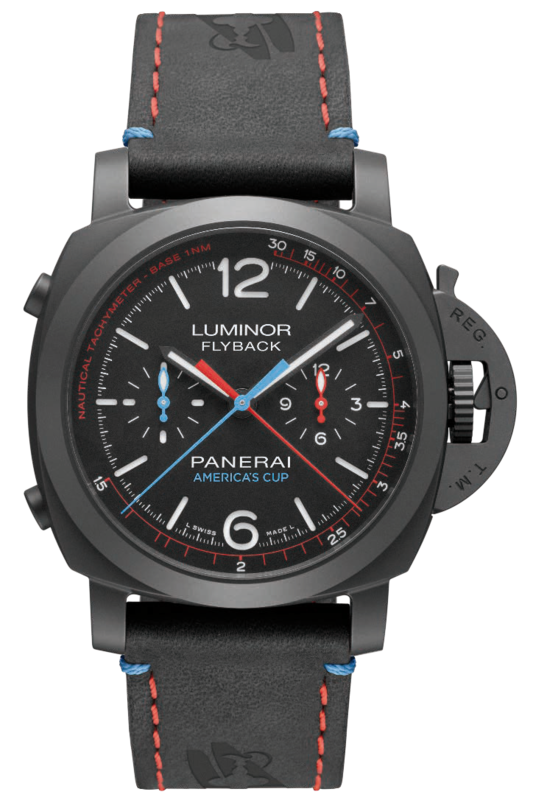 The first of these 5 special editions, is the Panerai PAM727, which is the official time piece of the America’s Cup. This 44mm Luminor Marina 1950’s Steel Automatic will be limited to only 300 pieces and pays tribute to the legend of the America’s Cup. The PAM727 is a play off of one of their best sellers and classics the PAM312 or more recently the PAM1312 (newer version). 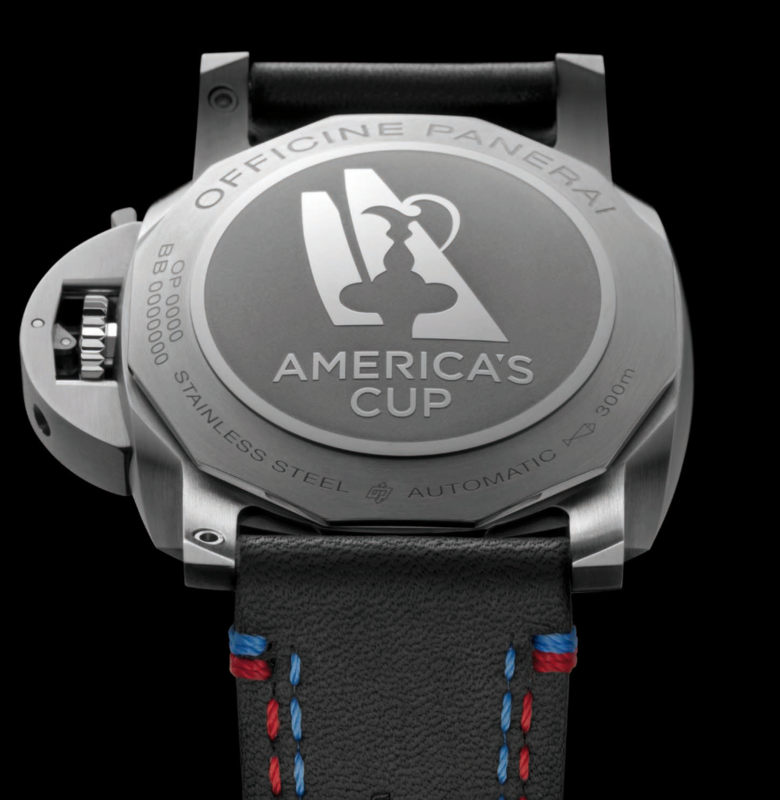 It has been personalized with the blue and red that adorn the America’s cup logo on the dial as well as the custom strap fitted on this piece. 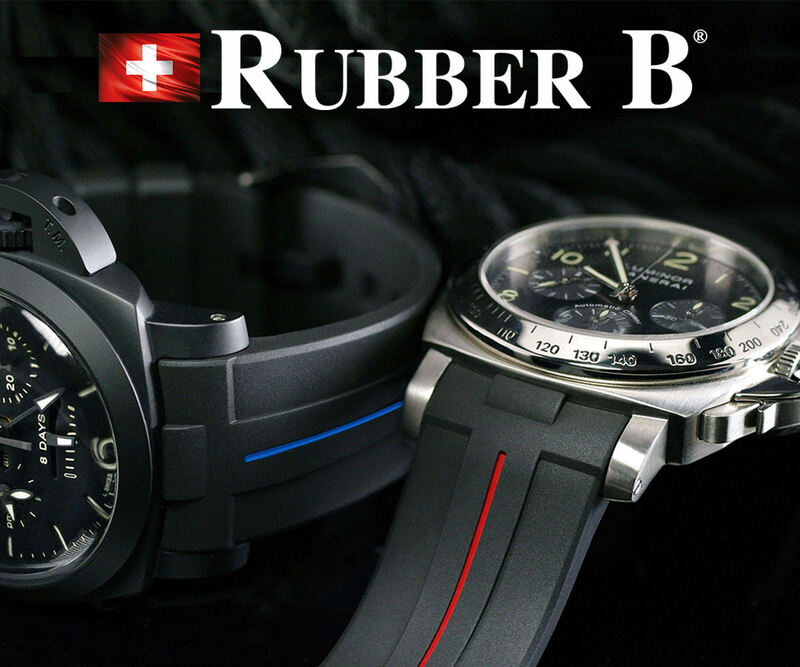 The stainless steel beauty is water resistance to 300 meters and features a polished bezel capping off a brushed case. 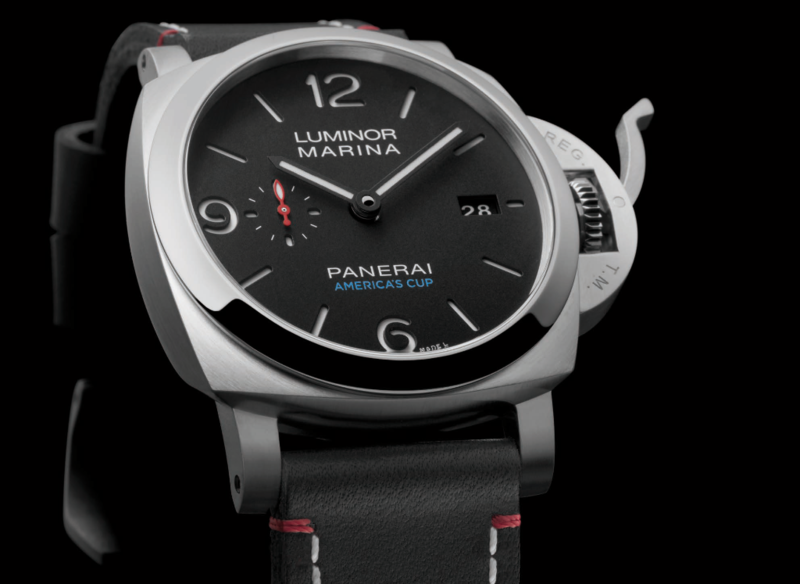 The classic black Panerai sandwich dial has some minor changes from it’s classic predecessor. 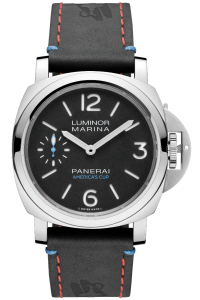 Under the Panerai name at the 6 o’clock position the words “America’s Cup” are written in blue instead of the word Automatic that you see on the PAM1312. In addition, the sub second hand which is blue on the PAM1312 is red in this instance. The movement in the signature piece of the America’s Cup is the new slimmer P.9010 automatic movement with 3 day power reserve. This movement has become the staple in all of their new 1950’s case Luminors that have been recently released. 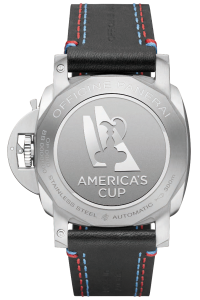 The case back is a solid piece of brushed stainless steel that has the America’s Cup logo etched into it. 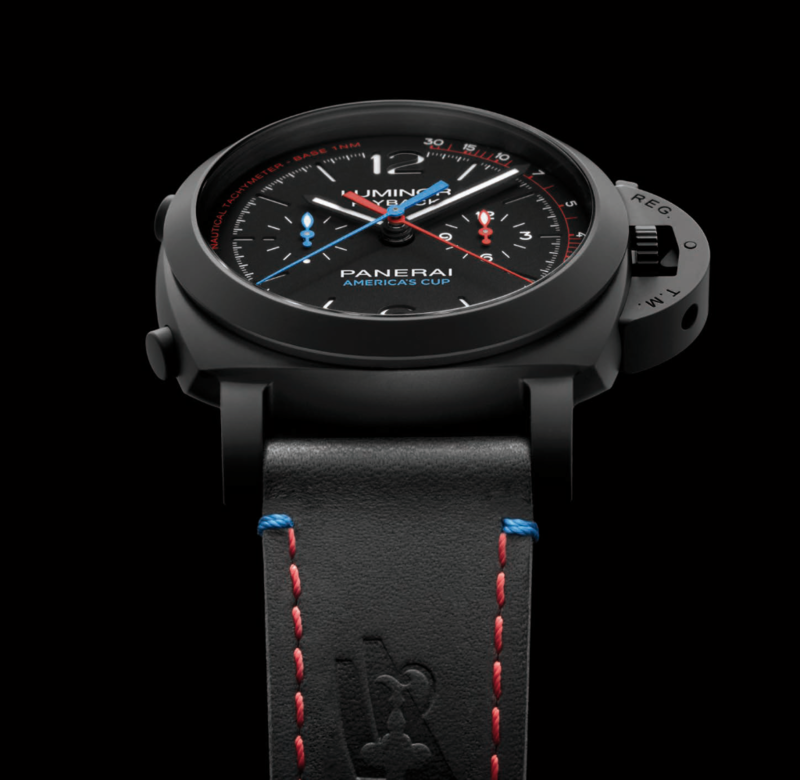 Finishing off the PAM727 is an untreated black leather strap with the logo embossed on either side of it with blue and red accent double stitching on both sides. This PAM727 special edition will be limited to 300 pieces and will cost $8,100 USD. MOVEMENT: Automatic mechanical, P.9010 calibre, executed entirely by Panerai. FUNCTIONS: Hours, minutes, small seconds, date. CASE: 44 mm, AISI 316L brushed steel. DIAL: Black with luminous Arabic numerals and hour markers. Date at 3 o’clock, seconds at 9 o’clock. POWER RESERVE: 72H. WATER-RESISTANCE: 30 bar (~300 metres). 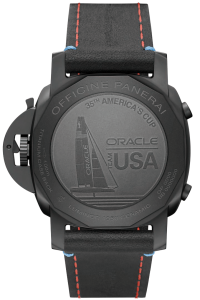 Beyond the major sponsorship with the 35th America’s Cup race itself, Officine Panerai has also teamed up to partner with Oracle Team USA as well as Softbank Team Japan. Along with being the Official partner of these two teams, Panerai has released 3 special editions tied to Team Oracle and 1 special edition for Team Softbank. One thing you will notice that differentiates the two teams is that the Oracle team features a blue sub second hand while the Team Softbank features a red sub second hand like the PAM727. We will first take a look at the 3 very unique pieces dedicated to Team Oracle of the United States. These three models are the PAM724, PAM725, and PAM726. 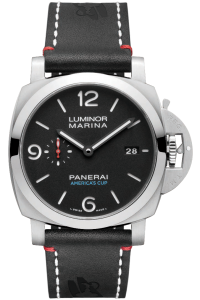 We will start off with the most basic of the three pieces, the PAM724 Luminor Marina 8 Days Steel. This 44mm timepiece is a new version of another classic in their current line of models. Based on the PAM510 Luminor Marina 8 Days, the PAM724 features a black sandwich dial with the words “America’s Cup” under the Panerai name in blue instead of the word automatic that is normally there. In addition to this change on the dial, the sub seconds hand in this model is blue instead of the standard stainless color. The watch is water resistant to 300 meters and features a solid case back with the Team Oracle sailboat, 35th America’s Cup, and Oracle Team USA text etched into it. This case back seals in the steady P.5000 8 day power reserve manual wind movement. 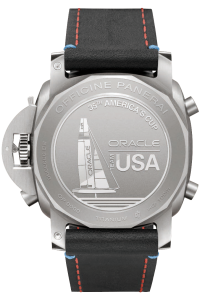 To finish off this watch as well as all the other Team Oracle pieces is a dual color stitched strap that has the America’s cup logo embossed on either side of the strap. The main stitching on either side of the untreated leather strap is done in red with an accent stitch near the lugs in blue. The PAM724 is a limited edition of 200 pieces worldwide and will run $7,100 USD. MOVEMENT: Hand-wound mechanical, P.5000 calibre, executed entirely by Panerai. FUNCTIONS: Hours, minutes, small seconds. CASE: 44 mm, AISI 316L polished steel. DIAL: Black with luminous Arabic numerals and hour markers. Small seconds at 9 o’clock. POWER RESERVE: 192H. WATER-RESISTANCE: 30 bar (~300 metres). The next piece in their Team Oracle line is currently my favorite of all the America’s Cup special editions. 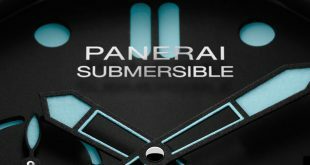 It probably is my favorite becuase it’s a completely different piece and not based on another previous model in the current Panerai lineup. The Panerai PAM727 is a 44mm Luminor Maria 1950’s case made out of ceramic which is ultra light and strong and features a gorgeous matte black finish. The timepiece uses the P.9100 in-house automatic chronograph movement with flyback functionality. This flyback function allows the hands to be zeroed and instantly restarted by a single press of the button without needing to stop the the chrono. The Chronograph is functioned with the use of 2 buttons. One at the 10 o’clock which will start and stop the chronograph while the one at the 8 o’clock position activates the flyback function. The PAM727 features a classic black dial with contrasting hands to increase readability. These hands are again in the color of the America’s Cup logo. The seconds hand is blue while the minutes hand on the chrono is red. To compliment these two colors, the sub seconds on the left of the dial uses the same blue while the hour hand on the right is in red. On the outer edge of the dial is a red tachymeter scale in knots, which enables the speed of a vessel over a given distance to be determined. 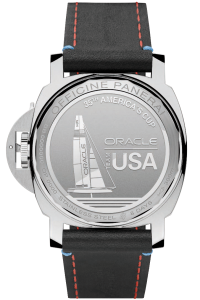 The watch is completed with a titanium case back with the Team Oracle text and sailboat, as well as the 35th America’s Cup etched into it. 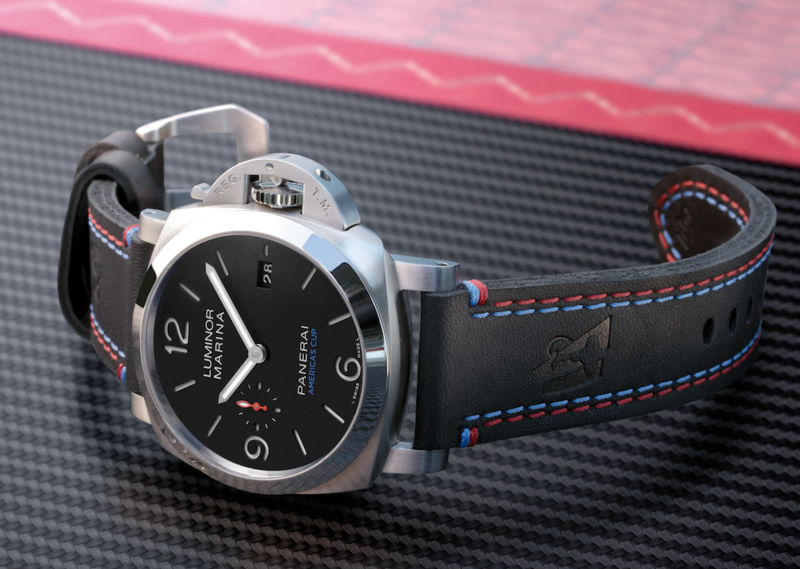 The strap as with the others features the embossed America’s Cup logo on the strap as well as red stitching on either side with a small blue accent stitch near the lugs. 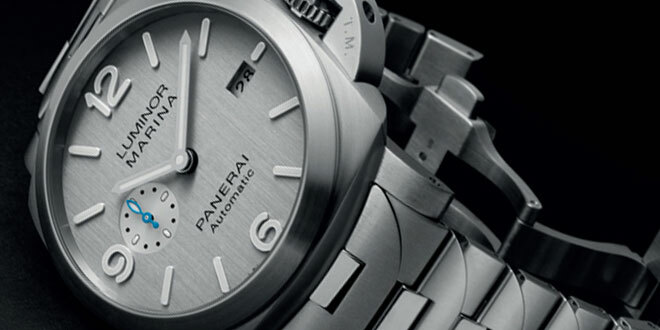 MOVEMENT: Automatic mechanical, P.9100 calibre, executed entirely by Panerai. FUNCTIONS: Hours, minutes, small seconds, flyback chronograph, seconds reset. CASE: 44 mm, black ceramic. DIAL: Black with luminous Arabic numerals and hour markers. Hours counter at 3 o’clock, seconds at 9 o’clock, central chronograph seconds and minutes hands, knot scale on the rehaut. POWER RESERVE: 72H. WATER-RESISTANCE: 10 bar (~100 metres). The final model in the Team Oracle group is the PAM726 Luminor 1950’s Regatta Chrono Flyback Titanium. This special edition is based around the PAM526 model that was released a few years back by Officine Panerai. The original one as with this piece was designed and created to be worn by sailing enthusiasts around the world. This version of the time piece like the others features the Oracle Team USA colors which are black, red, white, and blue. The original PAM526 featured a black dial with contrasting blue and orange hands. The sandwich dial is done in a flat black finish with large linear markers and figures that are standard in Panerai watches. The central chronograph hands are easily distinguished by the different colors to match the Team Oracle colors. 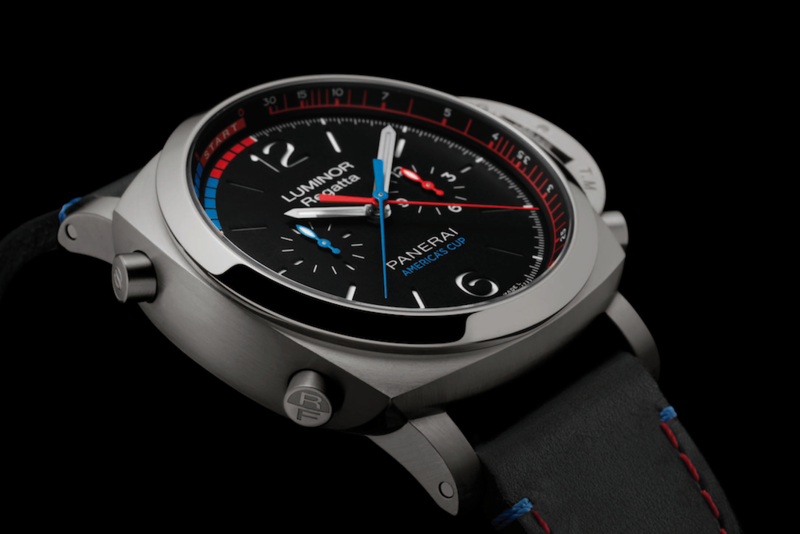 The blue central hand counts the seconds while the red central hand counts the minutes when the chronograph is active. The sub second dial at the 9 o’clock position done in blue while the hours are tracked at the 3 o’clock position with a red hand. On the flange of the dial are a 15 minute scale of the count-down counter, with the last 10 minutes marked in blue and red and also features a tachometer scale in knots which enables the speed to measured. The chronograph on the PAM726 is controlled with a push button at the 10 o’clock position to start and stop the mechanism. The push-piece at the 9 0’clock position will return all the hands to zero unless the hands are already moving. If they are moving then the button acts as a flyback function enabling a new time interval to be started immediately without starting and stopping the chronograph. There is a third pusher at the 4 o’clock position that will cause the central red chronograph minute hand to move back in one-minute jumps, until it is set to the correct countdown position. The PAM726 is powered by the P.9100/R automatic movement completely created in-house by Officine Panerai. 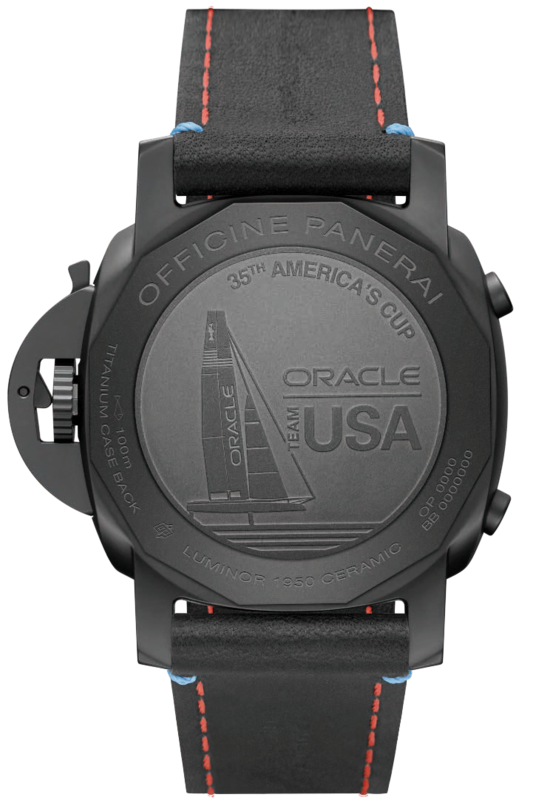 The case back closing it up is a solid titanium case back with the Team Oracle sailboat and America’s Cup text etched into it. As with the other pieces the untreated leather is personalized with the America’s Cup Logo that is heat embossed and features blue and red accent stitching. The PAM726 is a Special Edition Limited to 200 pieces and will retail for $17,900 USD. MOVEMENT Automatic mechanical, P.9100/R calibre, executed entirely by Panerai. FUNCTIONS Hours, minutes, small seconds, seconds reset, flyback chronograph, regatta countdown, knots scale for calculation of average boat speed. CASE 47 mm, brushed titanium. DIAL Black with luminous Arabic numerals and hour markers. Hours counter at 3 o’clock, seconds at 9 o’clock, central chronograph seconds and minutes hands, knot scale on the rehaut. POWER RESERVE 72H. WATER-RESISTANCE 10 bar (~100 metres). 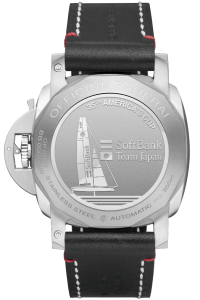 The final piece in the America’s Cup collection has been created for Team Softbank of Japan which races under the flag of the Kansai Yacht Club. 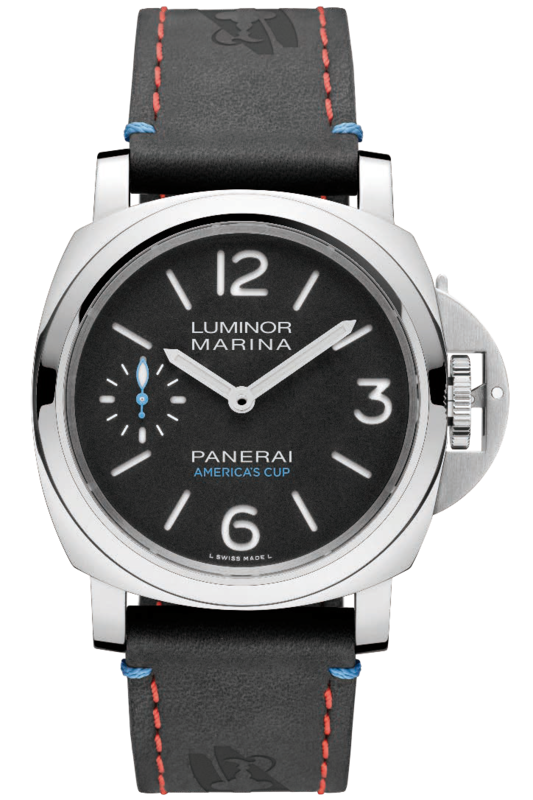 The timepiece selected to represent the team hailing from Japan is the PAM732 Luminor Marina 3 Day Automatic in Steel. The PAM732, much like the PAM727 which is the official watch of the entire race, is based on the PAM1312 that was recently released. There are a few differences when comparing it to the other America’s Cup model. 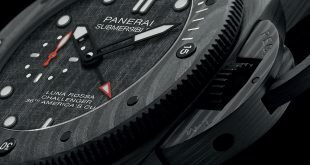 The dial still features the America’s Cup text under the Panerai text at the 6 o’clock position. The first difference you will notice is that the sub second dial features a red hand as compared to a blue hand in all the other team models, making it easy to distinguish the two. The case back feautures the Team Softbank yacht as well as the America’s Cup text etched into the back. 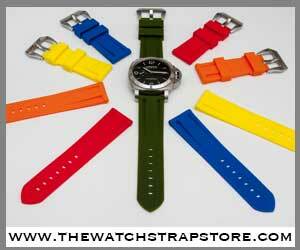 The final difference is another subtle one on the actual strap that comes with the timepiece. It features a white accent stitching on each side of the strap and small red stitch to match the sub second hand near the lugs as well as the Japanese flag. 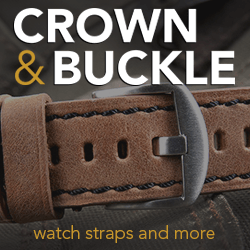 The only way to tell the difference between the PAM727 and the PAM732 without looking at the case back is going to be the strap. As with the PAM727 and PAM1312 the classic Luminor Marina 1950’s watch is powered by the new in-house P.9010 movement with 3 day power reserve. The PAM732 Special Edition is limited to only 150 units and will cost $8,100 USD. MOVEMENT Automatic mechanical, P.9010 calibre, executed entirely by Panerai. FUNCTIONS Hours, minutes, small seconds, date. CASE 44 mm, AISI 316L brushed steel. DIAL Black with luminous Arabic numerals and hour markers. Date at 3 o’clock, seconds at 9 o’clock. POWER RESERVE 72H. WATER-RESISTANCE 30 bar (~300 metres). 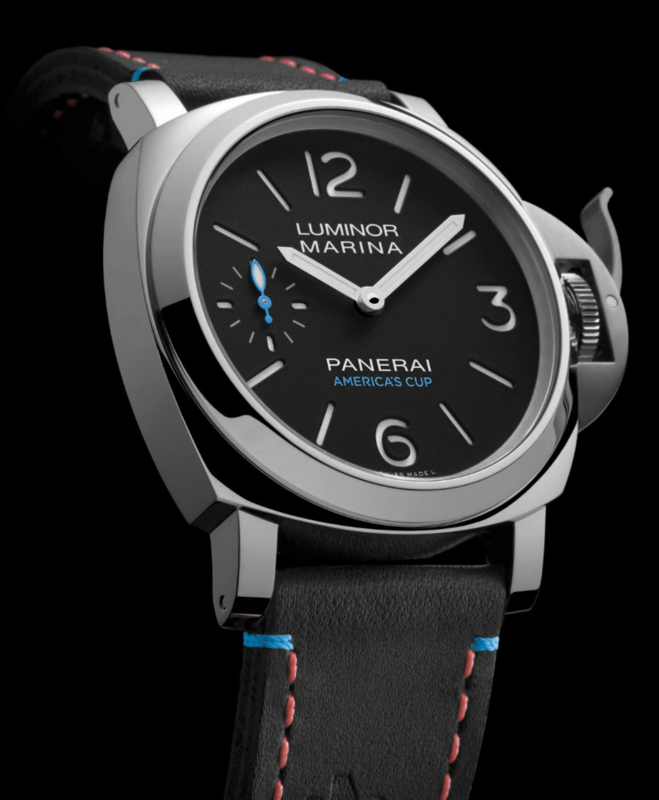 As we all are aware in the Panerai community, long time CEO and captain of Officine Panerai is an avid sailor and this partnership is one that ties two of his loves together. Panerai has been a long time supporter of the PCYC Regatta around the world but the sponsorship with the America’s Cup takes the connection to the sea to another level. 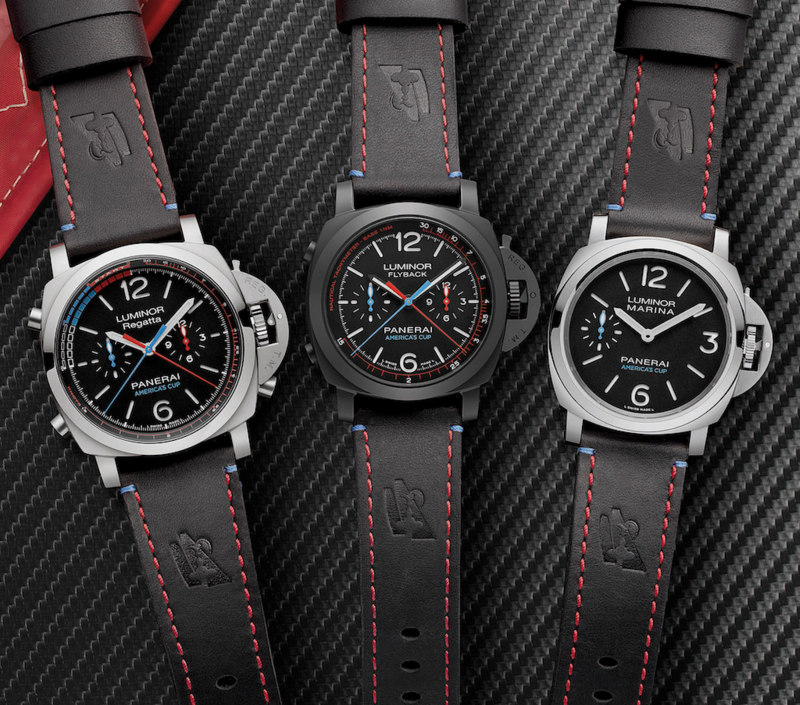 With an event as recognized around the world as the America’s Cup, Officine Panerai will now position itself firmly in the minds of the sailing community. I spoke to the point earlier, the only watch in this collection that is new is the PAM725 and quite possibly the only one that might push a non sailing enthusiast to buy this particular watch. 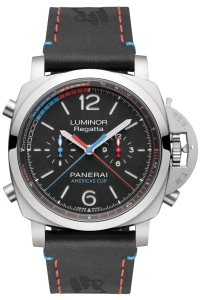 The rest of the watches are a newer version of classic pieces and probably will only appeal to Panerai enthusiasts that are also fans of the America’s Cup.